Picky Orchid- worth the wait! Received this orchid from a friend, but I wasn't able to make it happy enough to bloom for four years! Now in bloom, it was definitely picky, but worth the wait! Comments for Picky Orchid- worth the wait! This is a Phalaenopsis hybrid. It almost certainly has a lot of Phal. pulcherrima (formerly called Doritis pulcherrima) in its background; this species gives purple flowers and erect flower stems to its descendants. Thanks for the feedback. This lovely orchid has dark green, leathery leaves which have a maroon/purplish undertone than your average Phaleonopsis. I almost gave up on it for blooms. except the roots & leaves always looked very healthiy. 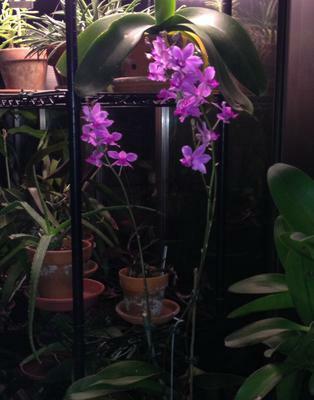 Bloomed beautifully when provided with a little more light and monthly mild doses of an orchid fertilizer.